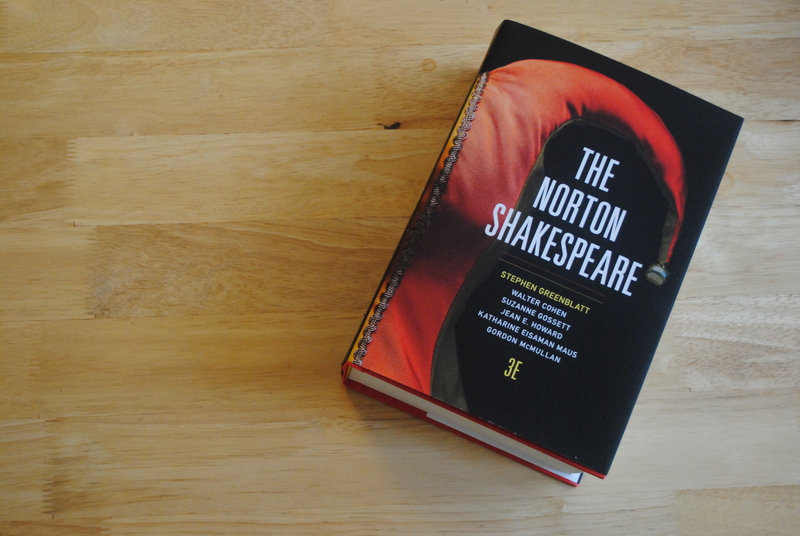 Let me tell you why the new Norton Shakespeare should be at the top of your Christmas list. But last night, I and the other MA candidates in Shakespeare Studies at King’s College London were invited to attend the launch party for the Norton Shakespeare Third Edition, and let me just tell you, I might be a convert. After Stephen Greenblatt (the general editor on this project and a name you should know if you’re in the Bardly business) gave us the background of this remarkable book, KCL’s very own Gordon McMullan got up to give us a digital tour. That may not sound exciting, but I and–judging by the small stifled gasps of excitement and murmurs “Oh my God, this is everything I’ve ever wanted” from the row behind me–my fellow graduate students were absolutely gobsmacked. Jaws on the floor. I’m fairly certain a few of us were on the verge of tears. Why? Because Norton has literally changed the face of Shakespeare scholarship. In his brief speech, Professor Greenblatt said something that stuck with me. To fully experience Shakespeare, he explained, you need two things: wonder and resonance. Of course, in a room full of academics resonance is paramount. We have to understand what we’re reading–not only linguistically, but culturally, historically, metaphysically, [insert adverb of your choice here]. And the new Norton edition, with textual and performance and editorial notes and timelines and illustrations and family trees amassed by an army of amazing editors, has more than made that possible. But their commitment to preserving the wonder of Shakespeare’s words is equally important. Instead of the cramped, claustrophobic two-or-three-column text we’re used to seeing in any hard copy of the Complete Works (usually printed, as Greenblatt joked, on ‘cigarette paper,’) the Norton Third Edition presents a clean page, in one column, with minimally intrusive footnotes. The Complete Works is not usually what I reach for when I want to curl up and revisit my favorite scenes of Merchant of Venice purely for pleasure, but Norton may have changed that. For the first time we have a Complete Works where the wonder doesn’t get buried by the resonance. You might be wondering how useful such a streamlined book is really going to be. Sure, it might make for a more pleasant reading experience, but aren’t you sacrificing function for form? Luckily for us, Norton refused to make that compromise–and this is where the digital edition comes in. Any purchase of the Norton Third Edition includes a unique registration code to access and download the digital edition. And as someone who’s been combing through the content for the better part of four hours, let me tell you, that it is absolutely worth it. Norton has brought Shakespeare into the digital age. Of course, all of the texts have been available online since the advent of the internet, but never like this. Norton’s Bookshelf application provides the user with an absolutely dizzying array of features, all (somehow) without sacrificing that clean, beautiful interface that keeps the wonder intact. With the digital edition you get not two versions of Hamlet, but four. You can look at the different Quarto pages of Romeo and Juliet side by side. You can even click on First Folio facsimiles, voice recordings, and pertinent performance notes, all tucked neatly in the margins. You can click on troublesome words for definitions, you can take notes and place bookmarks and highlight in three different colors. Don’t want to do any of that? You can hide it all have nothing but the words on a plain white screen if you feel your wonder starting to waver. I don’t mind admitting that I was one of those dramatically gasping graduate students. It’s difficult to explain to someone who doesn’t spend their days immersed in Shakespeare how truly revolutionary this is. It’s like having the Folger and the Globe and all their combined resources in your pocket. Something so comprehensive and exciting and easy to use is not only going to keep legions of graduate students from sobbing over their dissertations because they have to visit twelve different libraries just to access the resources they need. It’s also going to make Shakespeare accessible in an unprecedented way to a whole new generation of students and researchers and educators and theatre practitioners. The potential is unlimited. I think it’s safe to say that Norton has done something tremendous here. They’ve not only given us Shakespeare, but they’ve given us Shakespeare for the twenty-first century, and to their eternal credit, they’ve kept both the wonder and the resonance intact. It’s a brave new world.